“Press-in for your healing.” Those were the words I sensed the Lord speaking to me, just after I received a call from my surgeon telling me there were several suspicious spots on the C/T scan of my lungs. I held on to those words as I traveled to the church conference in Asheville with my friends Lisa and John, just after receiving the phone call. I knew in my heart that the miraculous healing the Lord had done the previous December, sparing my facial nerve, and the strong protection He provided while I underwent chemo and radiation therapy in the early months of 2012, could only mean that He would deliver me from whatever presence was in my lungs. Why would God abandon me now, in light of all that He had done for me so far? So I chose to believe that the Lord would finish what He began – it was simply a matter of how, not if. That conviction was a gift from the Holy Spirit and it gave me peace while I was away from home for several days. But I also realized that there were probably some harrowing times ahead for me – and that in facing them I would need to be absolutely focused upon the Lord, listening for His direction and standing on His word. So, after I arrived at the Provincial Assembly on the evening of June 6, I took a look at the schedule and I noted that I would have some free time in the afternoon on the following day. I sensed the Holy Spirit telling me that I should spend that time in prayer and let Him draw up a battle plan for me for whatever lay ahead. So that next day, as other participants in the Assembly headed off to attend workshops, I returned to my room, found some notebook paper and a pen, and opened my Bible. As I prayed for guidance, I sensed that I was being led to a passage in Second Chronicles. So I turned to chapter twenty and read aloud the account of how the Lord defeated the mighty army that had gathered to wage war against King Jehoshaphat and the people of Judah. Years before I had listened to Beth Moore as she taught from this passage – a story which had never come to my attention before – and since then I’ve turned to it several times, using it as a sermon illustration about the importance of offering praise to the Lord in a time of trial. Once the people are assembled in the house of the Lord, Jehoshaphat leads them in prayer. However, he does not begin with a cry for help. Instead, he begins with praise, recounting the greatness of God and His mighty deeds on behalf of their ancestors: “O Lord, God of our fathers… In your hand are power and might, so that none is able to withstand you…” (v. 6) Jehoshaphat concludes this time of praise by declaring that he and the people of Judah have worshiped the Lord in His temple, just as their forebears did, and they stand on the same promises He made to them. And it is only after a time of praise, in which he remembers all that God has done for His people in the past, that Jehoshaphat petitions the Lord. 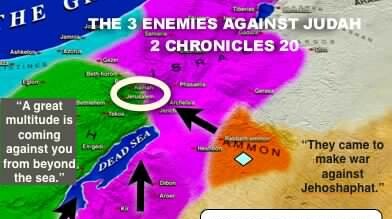 He asks for God’s assistance and protection now, declaring that only the Lord is capable of defeating this vast army – and that the people of Judah are wholly dependent upon Him to save them. The Lord’s response is swift and commanding. He tells them not to be afraid, “for the battle is not yours but God’s.” (v. 15) Then He instructs them to meet this army on the battlefield, but He makes a point of saying that they will not need to fight in battle. Instead, they are to “stand firm, hold their position, and see the salvation of the Lord on their behalf.” (v. 17a) God concludes by saying, “Do not be afraid and do not be dismayed. Tomorrow go out against them, and the Lord will be with you.” (v. 17b) At these words, Jehoshaphat and the people of Judah fall down and worship the Lord. What stuck in my mind was how God had clearly stated that the battle was His, and not theirs. Therefore, I concluded that in whatever lay ahead for me, I was to see the Lord as the One doing battle against the pestilence in my body. I was to stand ready, but not so that I could join the Lord in battle. Instead, I was to wait and hold onto God’s promises as He did battle on my behalf. I also noted how praise played in important role as the King and the people of Judah brought their concerns to the Lord and as they waited on the Lord to act on their behalf. So, I decided that praise should be an important component of each day as I went forward. As I looked over the notes I had made, I sensed I had God’s battle plan for me. I concluded my study with a time of praise and petition. Later that afternoon I rejoined my fellow participants in the Assembly. Each time a friend or colleague would inquire about my health – for everyone who knew me was aware of the surgery and treatments I had recently undergone – I shared the most recent information about the results of the C/T scan. And each time, I was immediately enveloped in prayer for healing. I was so thankful to be among Christians who didn’t just say they would pray for me; they did so on the spot. Hands were laid on me and prayers for healing were offered at least ten times over the course of those three days. Gil was right to insist that I not cancel my plans to attend the Assembly. While I was away, he was busy at home contacting friends and asking them to lift us up in prayer. Once back in Raleigh, I had to wait another ten days until Gil and I could meet with a thoracic oncology surgeon at the UNC Cancer Hospital. We spent a few of those days at the beach with Caleb, trying to stay calm and not let our fears get the best of us. We had no idea whether the spots were cancerous or not, but we knew that whatever they were, they were not harmless. Finally, the day of the appointment arrived. On Tuesday, June 19, we met with Dr. Ben Haithcock, an Assistant Professor of Surgery and Anesthesiology at the UNC Medical School and the Director of the Cardiothoracic Surgery Residency Program. Dr. Haithcock was personable and direct – and we liked him immediately. He wasted no time in telling us that after reviewing my scan he was sure that the questionable spots on my lungs were indeed cancerous tumors. But he was also quick to say that there was good news. First, the tumors were miniscule – two tiny ones in the right lung and a slightly larger one in the left. Second, they were found early. He told us that most tumors in the lungs are discovered only after a person begins to show symptoms of disease, such as coughing up blood, at which point the tumors are usually too large to remove or treat successfully. Dr. Haithcock then outlined the steps to be taken in order to determine the origin of the tumors, and then, to remove them. The source of the tumors was unknown at this point. He said they could be a metastasis from a tumor somewhere else in my body, or from the original parotid gland tumor, or they could be a lung cancer. Therefore, the first order of business would be to determine whether there were additional tumors anywhere else in my body. Dr. Haithcock scheduled me for a PET scan – a test which would detect the presence of cancer anywhere in my body from the neck down – and an MRI of my brain. He also scheduled me for a lung assessment to determine how well my lungs were functioning and whether I could successfully undergo surgery. Once the results of all these tests were in, he would know how best to proceed. All three tests were scheduled for Friday, June 22. I was grateful that they could be done so quickly, but the thought that cancer could be lurking throughout my body was almost more than I could bear. By God’s grace I had sermons to prepare, which would keep my mind and heart thoroughly engaged, because I was serving as preacher and celebrant at Church of the Holy Cross in Raleigh while the Rector was away on vacation. Also, my friend, Cynthia, was forming a healing prayer team and had asked me to be a part of it, so I had meetings to attend and people to pray for. Being used in ministry is always a blessing, but never more so than now. But the greatest gift was the realization that the timing of the C/T scan of my lungs, which I had undergone just two weeks before, had been providential. No one suspected at that point that I had cancer in my lungs. Dr. Weissler had ordered the test simply to make sure that what had appeared to be scar tissue, in an earlier scan, hadn’t developed into something more sinister – which, as it turns out, it hadn’t. But, if he hadn’t ordered that follow-up scan, the now miniscule cancerous tumors would not have been discovered until I had begun to experience symptoms of disease in my lungs – probably many months down the road – and at a point at which they would have been quite large and incredibly difficult to treat successfully. Clearly, the Lord had prevailed in this battle, although the war was still raging. Still, I saw victory in this – and it gave me hope that God would finish what He had begun. Next installment: Test results and surgery.